This program is a generic optimization tool that uses Microsoft Excel (versions 2003 and newer) as a platform for the definition of the problem at hand. Practically any problem that can be formulated in a spreadsheet can be tackled by this program. Examples include problems in finance, engineering, resource allocation, scheduling, manufacturing, route finding, etc. xlOptimizer differs radically from the built-in "solver" pack of Microsoft Excel in the sense that it implements a host of customizable, state-of-the-art Evolutionary Algorithms (EAs), homogenized and arranged in an intuitive interface. These algorithms are considered to be very good "global optimizers", i.e. 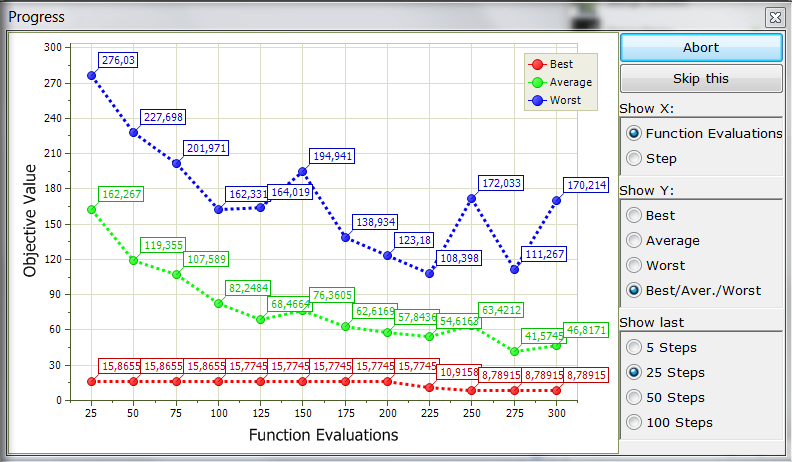 they are able to find very good solutions (from a practical point of view) with few function evaluations. This renders them ideal for very difficult (multi-parametric, non-differentiable, discontinuous, combinatorial, deceptive, etc) and/or expensive problems (i.e. each function evaluation may require several minutes). Apart from the built-in functions of Excel, which are readily available, external functions can be easily implemented through dynamic-link-libraries (dlls), so that virtually any problem can be formulated efficiently within a spreadsheet. xlOptimizer is suitable for practitioners with small or even no knowledge at all of the inner workings of EAs. As long as the problem is formulated in a spreadsheet, it is very easy to set-up a number of scenarios and optimize, which is translated into significant profit or improvement in performance. 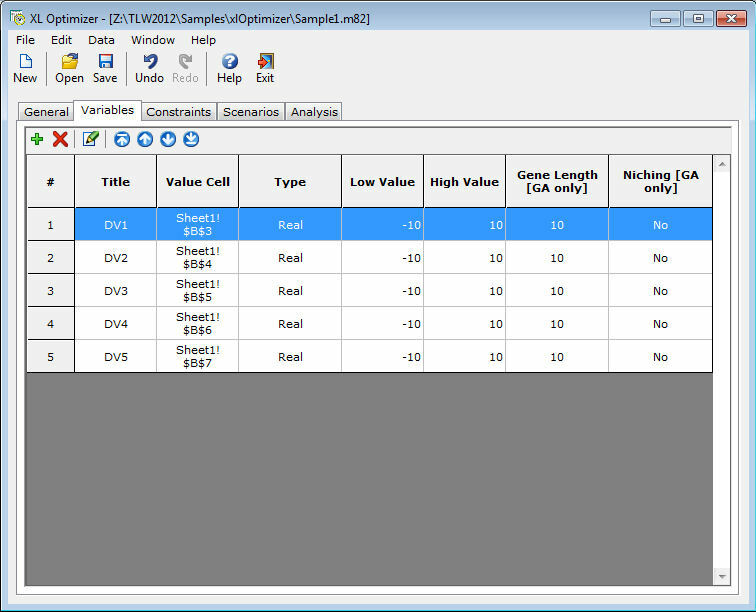 All the parameters controlling the algorithms are set automatically to commonly used values. Concise tips are included in each step of appropriate wizards, which guide the user. Extensive on-line and off-line support is also available. xlOptimizer is also ideal for researchers in any scientific field that want to use a simple yet powerful tool for optimization. All parameters controlling the behavior of each algorithm are customizable, so that experimentation can reveal the optimum set of values. 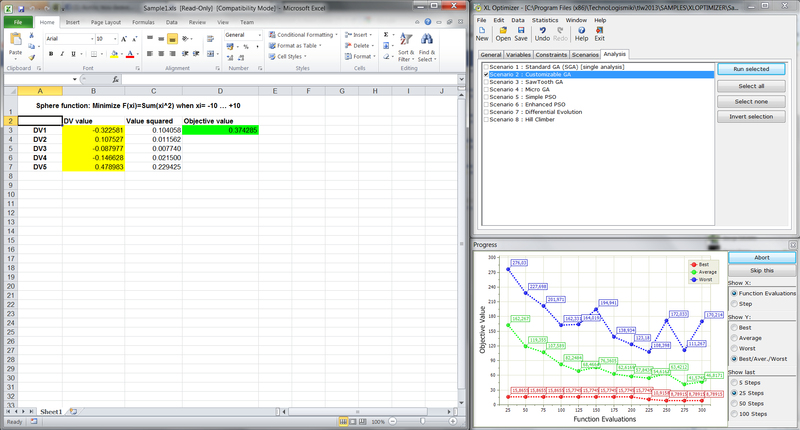 Moreover, a simple, Excel-like, built-in function evaluator is included, so that the parameters can be adaptive and not fixed. For example, the optimum population size of a Genetic Algorithm (GA) depends on the complexity of the problem. This can be easily set-up into a function, that produces the population size based on e.g. the chromosome length. Finally, automation tools are included that facilitate the examination of the performance of the Algorithms. These include the capability of performing multiple independent runs, using specific or random seeds, and storing the results into appropriate folders. The log of each run contains all the necessary information regarding the evolution, and can be easily analyzed further using ASCII text editors. The core modules of xlOptimizer have been used in many papers published in peer-reviewed international scientific journals and proceedings of international conferences. For more information, please contact TechnoLogismiki. Handles practically any problem that can be formulated in a spreadsheet (Microsoft Excel 2003 or newer required), using either built-in or external functions. 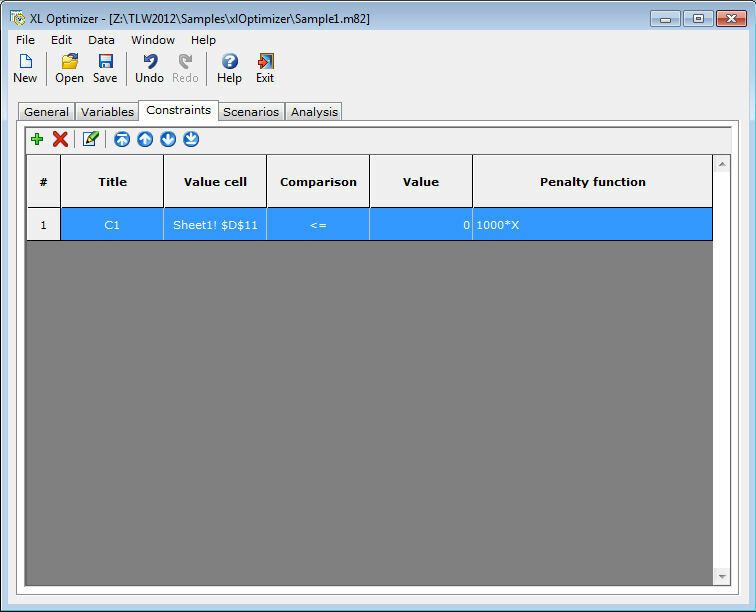 Handles any number of variables, constraints (through customizable penalty functions) and scenarios. These are limited only by hardware. The problem can be single-objective minimization, maximization or target-value. Multiple fully-customizable, state-of-the-art Evolutionary Algorithms are available: Custom Genetic Algorithm (GA), Micro-GA, Sawtooth-GA, Simple Particle Swarm Optimization (PSO), Enhanced PSO, Differential Evolution (DE), Artificial Bee Colony (ABS), Genetic Algorithms for permutation problem (GAPerm). All algorithms are homogenized and arranged within an intuitive interface. Full logs are produced, which can be further viewed and analyzed using simple ASCII text editors. 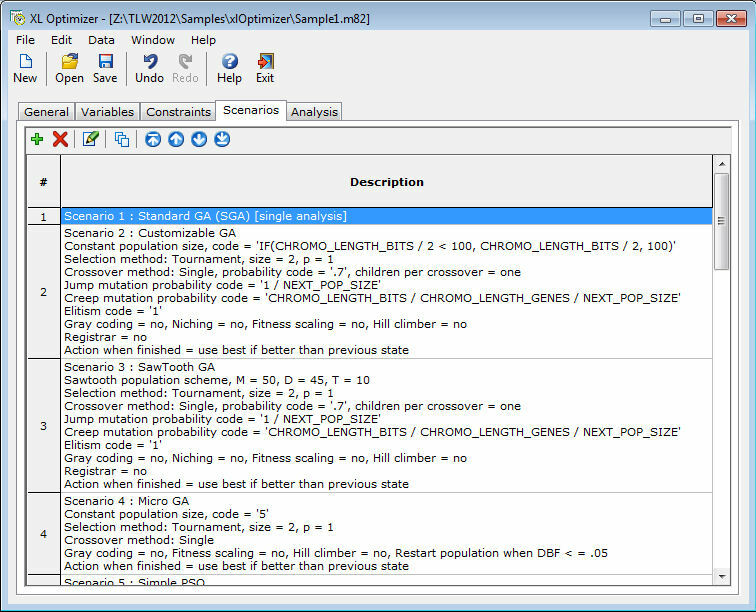 Optional graphical representation of the evolution reveals valuable information such as current best/mean/worst objective values in the population, current function evaluations, evolution progress in the last evolutionary steps, etc.